Johoreans are excited about the recent breakthrough in talks between Singapore and Malaysia and are looking forward to reaping the benefits of future developments. As a Johorean, I welcome the historic agreement reached at the meeting last Monday between Prime Minister Datuk Seri Najib Razak and his Singaporean counterpart Lee Hsien Loong. Finally, we can see some light at the end of the tunnel after being gridlocked for two decades over the interpretation on the Points of Agreement signed between former Malaysian Finance Minister Tun Daim Zainuddin and Lee Kuan Yew on Nov 27, 1990 – the day he stepped down as prime minister of Singapore. Even though the agreement may have already thrown some politicians into conniptions, it is nevertheless reassuring to see both prime ministers, who are also sons of the founding fathers of our two nations, determined to improve and enhance ties by increasing connectivity between our two peoples geographically and economically. In fact, Johor Baru residents are particularly excited over the announcement. Taxi drivers and commuters are overjoyed that authorised cabs will soon be able to pick up and drop off passengers from any location in Singapore or Johor Baru instead of at just two places – Bugis in Singapore and Kota Raya terminal in Johor Baru. In addition, bus services between Johor Baru and Singapore will be doubled with the introduction of four new routes on each side. It is also hoped that the reduction of toll rates at the Second Link will help ease the traffic congestion at the Causeway. However, what local residents most want is the creation of a rapid transit system link between Johor Baru and Singapore as close to 100,000 Malaysians commute daily between both destinations to work and study. 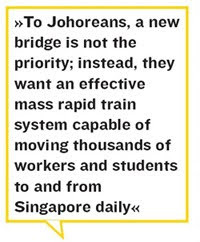 To them, a new bridge is not the priority; instead, they want an effective mass rapid train system capable of moving thousands of workers and students to and from Singapore daily. As this is projected to be ready only by 2018, Keretapi Tanah Melayu Berhad must immediately get down to prepare for a huge increase of Johor Baru residents opting to travel to Singapore by KTM trains during this transition period when its station is relocated from Tanjong Pagar to the Woodlands Train Checkpoint in July next year. Hence, KTM must improve on its services and the comfort of its train coaches. There is no doubt that the integrated rapid transit system link will bring long-term benefits to Singapore as well as Johor, particularly to the two integrated casino resorts in Singa­pore and the Iskandar Development Region in Johor. Similarly, the image of Johor Baru city will be transformed as, too often, the experience of travelling to Johor Baru from Singa­pore has been likened by many tourists to travelling to Tijuana, Mexico, from San Diego, USA. 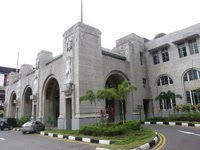 In this respect, it is a wise decision to give up the KTM station in Tanjong Pagar. Surely, the old and unimpressive KTM station should not be the gateway to those who intend to visit Malaysia through this route. It makes no sense to hold on to these pieces of leased properties, the use of which is strictly restricted to railway operations by the 1918 Railway Ordinance. It is also not legally possible for Malaysia to turn the Tanjong Pagar station, for example, into a Kuala Lumpur Sentral type development. For Singapore, this will substantially lighten the burden on their enforcement agencies in checking the KTM trains from Johor Baru to the Tanjong Pagar station for illegal immigrants and drug smuggling. However, as soon as KTM vacates the Tanjong Pagar station, Singapore will own 40% of the six pieces of land to be jointly developed through the 40% stake held by Singapore’s Temasek Holdings Limited in M-S Pte Ltd (JVC) as the properties will be vested and transferred to the JVC. Malaysia’s 60% in the JVC will be held by Khazanah Nasional Berhad. The six pieces of land can also be swopped for pieces of land in Marina South and/or Ophir-Rochor with equivalent value. This is understandable since the value of these lands has been enhanced after conversion of land use. It follows for this joint development to succeed and for both countries to maximise the benefits of the venture, the JVC should be professionally managed and free from political interference. Though Malaysia has majority control over the JVC, Singapore can still exercise control over it as it is still subject to Singapore property development laws and authorities. Hence, judging from past experience, one has to concede that the success of this new venture is still very much dependent on the prevailing level of relationship between the two countries. That said, Khazanah must never at any time for reason of making quick gains sell any part or the whole of its 60% stake to Temasek as this gigantic development is also a great opportunity for Malaysian workers to acquire skills and improve themselves. Preference should be given to workers and professionals from Johor, albeit this is sadly not enthusiastically pursued by Khazanah in the Iskandar Development. With regard to water, Malaysians must now acknowledge that it is no longer our bargaining chip with Singapore. The fact that Singapore is prepared to allow the 1961 Agree­ment to expire next year without re-negotiation shows that Singapore is water self-sufficient. Singapore has obviously over the years increased its water resources from two original taps – local catchment from their 14 reservoirs and imported water from Johor under the 1961 and 1962 Agreements – to five, which include treating waste water, desalinating sea water and importing water from Indonesia. The 1962 Agreement which allows Singapore to draw water from the Johor River will only expire in 2061. But interestingly, after the Gunung Pulai, Skudai and Tebrau waterworks are handed back to us when the 1961 Agreement expires next year, Johoreans will find it more expensive to operate these facilities compared with buying treated water from Singapore. Since 1961, the price has been 50 sen for every 1,000 gallons. Singapore spends about RM2.50 to treat it. All these go to show that Johoreans will be most affected whenever there is a deterioration or improvement in our relations. Sadly, we are more influenced by rivalry and pride whenever we deal with one another, always forgetting that serious ramifications will follow as our peoples are closely related in family ties. For now, though, Johoreans can only hail this latest breakthrough as it will bring long-term improvement to many ordinary lives on this side of the Causeway. *Published in The Sunday Star, 30 May 2010.